I love me some art. I’d say this is the best example of StuART I’ve ever seen. Time for a little challenge. You see, I travel on Saturdays (which, by the way, I’ve learned is also called “Caturday” by some of my feline furiends). But that doesn’t mean I go to a real place. Usually, I ask you to guess where I am. Today, I have no idea. So, in the spirit of all things fun, where do you think this might be? I’d like this fabulous image to hang in the Virginia Museum of Fine Art. Why? Because it’s a fabulous place and it needs me. Is there another reason? This entry was posted in The Scottie Chronicles and tagged art, dogs, museums, Richmond, Stuart the Scottie, The Scottie Chronicles, travel, Virginia, VMFA. Bookmark the permalink. Pittsburgh? or the cattle raiser museum in texas? hmmm, it looks like snow in the background. So are you in Alaska? I love your posts Stuart and you are cute enough to be a treasure at the Virginia Museum of Fine Art. I think those are red and it’s a Red Bull convention. Red Bull is the highest selling energy drink in the world, with 5.387 billion cans sold in 2013. OK, now I don’t care if I got it right. I got a beautiful serenade! That makes me an honorary Purple Cow at Williams! Woot! Well I guess the answer is above, all I can say is I love the Andy Warhol effect and I want to say you are at the Andy Warhol Museum in Pittsburgh! Wherever it is, Stuart, you’ve added a ton of class to the place. Two Stuart pictures against all those Elsie The Cow look-alikes, you’re the man, Stu! I don’t mean to insult cows – it’s just that Scotties are way more appealing! 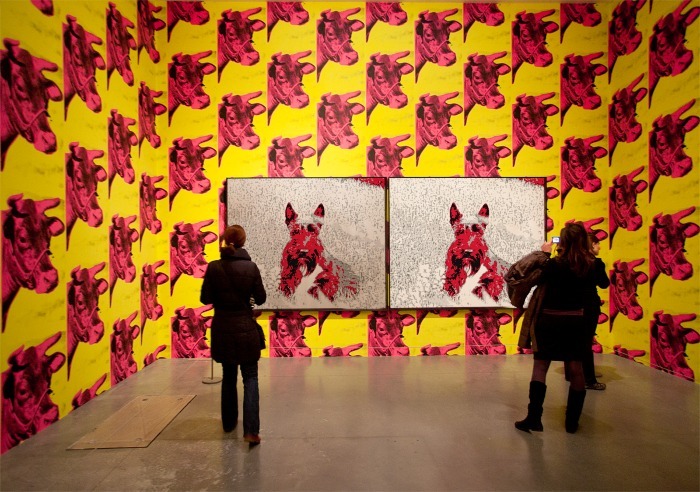 I fink it are da Factory, Andy Warhol’s studio. I’ve learned to let Kyla answer first because she’s always right!